Alerts are a starter plan feature that helps you track your Project Time Estimates. Using this feature you will be alerted when your projects that have a time estimate reach a certain percentage of that estimate. Alerts can be set up from the Workspaces page via the Toggl web app. Once there, switch over to the "Alerts" tab and select when your alerts will be triggered and who should be alerted. You can set up an alert based on a project or a task, select the percentage of completion of an estimate and who you'd like to be alerted. After you select all the parameters click on the green "Add" button to save your alert trigger. Alerts are only sent if the Project is ‘Private‘. 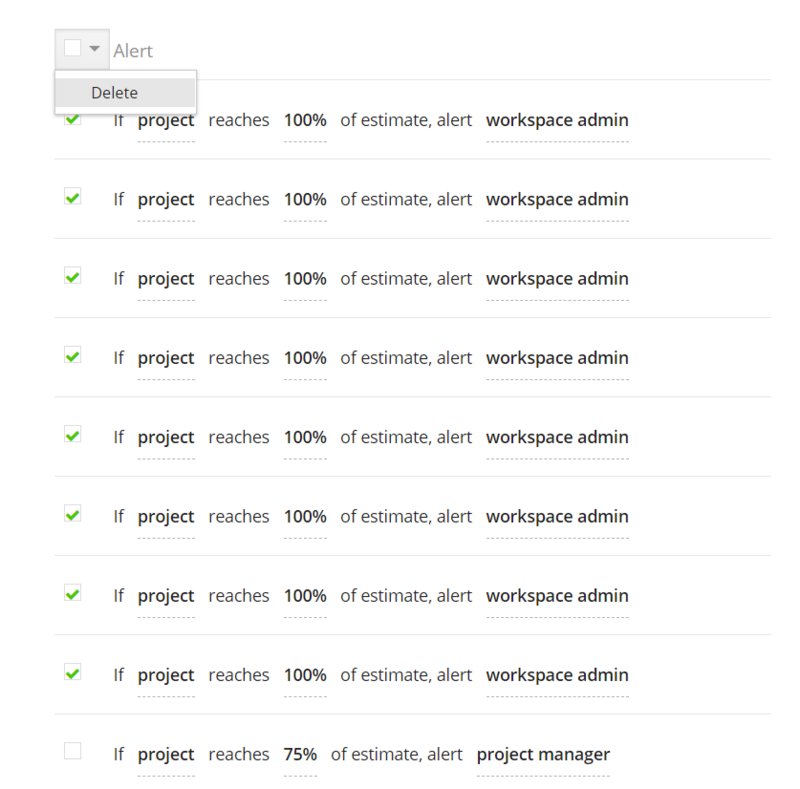 Alerts apply for all Private Projects across the whole Workspace. Alerts are only sent for Projects that use Manual Estimation, not Task-based Estimations. Alerts are displayed in a list on the Workspace Settings page under the "Alerts" tab, as seen on the screenshot below. You can also bulk delete alerts by using the main checkbox at the top of the list. Simply select multiple alerts and click on the down-arrow sign next to the main checkbox at the top of the list to delete your selected alerts. Checking the main checkbox will select all alerts at once.